KIEV, Ukraine -- Leonid Sheremet from Kovel, a city in western Ukraine, started his small business in 2000 with an initial investment of $700. Ukrainian small-business owners have camped out in front of the parliament building in Kyiv to protest against the new Tax Code. He purchased one bag of new clothing, which he then sold for a profit. Today, Sheremet's small retail business employs two people and pays them a respectable salary. He says Ukraine's current simplified tax, which applies to small entrepreneurs, enabled his business to grow. Under the current system, small and medium-sized businesses pay a flat tax of 200 to 600 hryvnyas ($20-$75) per month, depending on the nature and volume of their business. Introduced in 1999, the onetime monthly payment allows business owners to avoid dealing with tax officials, who are seen as corrupt. Many credit the simplified code with reviving small businesses. But a new government-proposed Tax Code, which parliament is due to consider in a final reading on November 18, would close that loophole. Everyone -- from small businesses to major corporations -- would have to file complex, itemized returns with the authorities. The government argues that the new system is needed and will bring in extra revenue during a severe economic downturn. Sheremet says that if it's implemented, he'll be forced to lay off employees, because taxes will simply be too high for him to turn a profit. So, he and thousands like him have taken to the streets of Kyiv and other cities to protest. The proposed new Tax Code has been clouded in controversy since its inception. First introduced in July, the document was criticized by Ukraine's President Viktor Yanukovych and subsequently returned to Prime Minister Mykola Azarov with thousands of amendments and criticisms. A new version is now being considered by legislators. Ukraine's proposed new code rewards some and punishes others, says economist Anders Aslund, who has served as an economic adviser to the governments of Ukraine, Russia, and Kyrgyzstan. Aslund, currently a senior fellow at the Washington-based Peterson Institute for International Economics, says under the new legislation, big companies will be rewarded, and small companies punished. "A five percent dividend tax cap for big companies is a big advantage and could lead to Ukraine's biggest companies actually being based in Ukraine and not in offshore accounts," Aslund says. However, he qualifies, "The two big drawbacks are that the simplified tax is being [eliminated], and another worry is that ordinary international accounting principles are not being introduced." There are currently some 3 million registered small-business owners in Ukraine, who in turn employ another estimated 6 million workers -- out of a total population of some 46 million. The new code would incorporate these small businesses into the general tax-accounting system, which protesters say would open the door to corruption and manipulation by tax authorities. The main problem with the new tax legislation is that it takes something simple and makes it unnecessarily complicated, says opposition legislator Ksenia Liapina. The new code, she says, will encourage entrepreneurs to bypass the more expensive, legal tax system and, instead, work "in the shadows." "What’s the point of paying 400 or 600 hryvnyas? What for? To have daily audits and checks, a constant hassle?" Liapina argues. "The entrepreneur will do what he did back in 1998 -- pay five hryvnyas in tax to the budget and give 200 hryvnyas as a bribe to the tax inspector." According to the World Bank, Ukraine's current tax system is the third-worst in the world, after Belarus and Venezuela. Aslund says the ruling Party of Regions' urgency in pushing the new code through parliament looks like an attempt to prove to international lenders that they are serious about reforms. But the Party of Regions and the government were clearly not expecting such an outpouring of protest. Vladyslav Lukyanov, deputy chairman of parliament's Budget Committee and a Party of Regions member, said he failed to understand why the code would provoke such demonstrations. "Today, this Tax Code is a much better document than all the legislation which regulates tax collection and tax administration," Lukyanov said. Volodymyr Dubrovskyy, a senior economist at the Kyiv-based Center for Social and Economic Research, sees a political dimension to the anti-tax protests. He says the abolishment of the simplified tax is a direct attack on the most independent section of Ukrainian society -- the entrepreneurial middle class -- the very same people who ardently supported the Orange Revolution. But where the Orange Revolution predominantly attracted people from central and western Ukraine, the current tax protests encompass all of Ukraine. 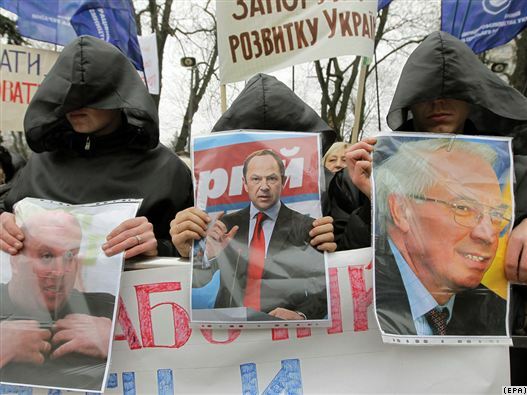 Demonstrations have been held in the eastern city of Kharkiv, as well the home base of the Party of Regions, Donetsk. "What is most encouraging is that people from the east and south of Ukraine, these are pragmatic people, when their interests are threatened, they also take to the streets to protest," Dubrovskyy says. "In Ukraine the national idea is pragmatic -- survival, well-being. When these things weren't threatened, there was no revolt. Now, there is a revolt." Ukraine's proposed new Tax Code is a voluminous document of 503 pages, 19 sections, and 340 articles. With the nearly 4,500 corrections and amendments to be considered, parliament only succeeded in approving five sections in a vote earlier this week. The vote for the remaining 13 sections is planned for November 18.